The county’s first agri-hood may be coming to Encinitas. At last week’s Encinitas City Council meeting, we opted to move forward with a project that would pair 250 smaller homes with ten acres of farms that would produce food for the people who live there. 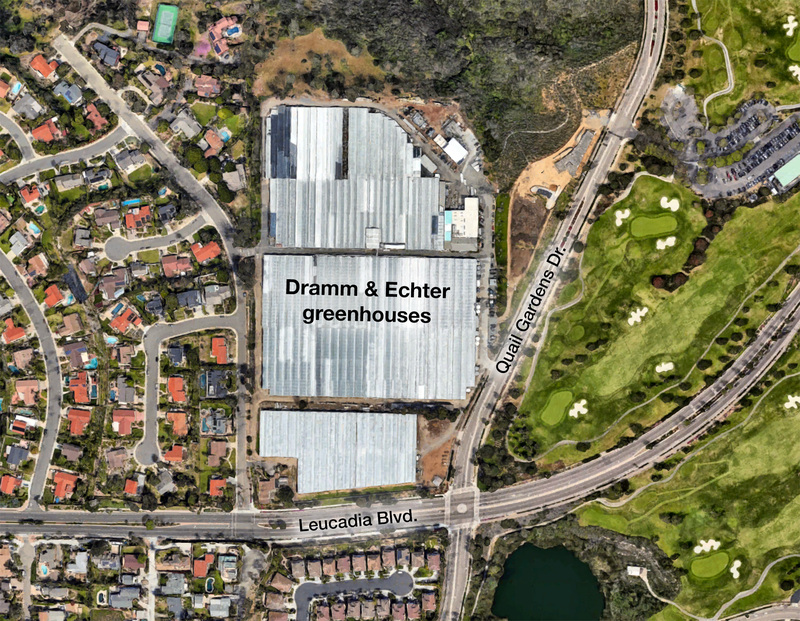 The Leucadia greenhouse property currently owned by Dramm & Echter (which earlier had asked for approval to grow marijuana) is now requesting to grow an agri-hood (without marijuana). It’s called Fox Point Farms. Here’s the link to the current commercial flower business, which doesn’t yet reference the agri-hood. At our meeting, the City Council took another evaluative pass at the list of sites that could accommodate the state-required upzoning for new housing, and we included this current greenhouse site in our plan based on their agri-hood proposal. Before any upzoning is approved, the applicant has agreed to memorialize in writing that 10 acres would be set aside for agriculture. The Dramm & Echter property in Leucadia may become San Diego County’s first agri-hood community. Why are we doing this? The state requires Encinitas to find places for new homes. In recent meetings we’ve been scouring the city, looking at every vacant or under-utilized parcel that’s larger than a half-acre. Like many of you, there’s a strong part of me that wishes we could stop development completely. But that’s simply not possible or practical. California’s population is growing, jobs are available here, populations and demographics are changing, and people are finding themselves without homes or unable to afford homes. The homelessness epidemic is directly tied to the lack of affordable housing, among other factors. The state legislature has made the housing crisis every city’s responsibility. Based on changes to state law in 2018 along with three housing lawsuits against the city, we are finding the zoning for about 1,600 more homes (we currently have about 25,000 total homes and 20,000 of them are single family homes). Much of the upzoning will be on vacant or under-utilized land, as required by state law. Our last effort to produce a state-compliant housing plan (known as Measure T) was resoundingly rejected at the ballot box in 2016. I’ve learned from that experience, and I hope that our new approach will be more successful. Leading up to the 2016 election, every candidate for local office was in favor of passing Measure T. There was unanimity among all the incumbents and the candidates that we needed to pass Measure T. But the plan itself did not have any particularly appealing project (like an agri-hood), and the elected officials didn’t have to get their hands dirty choosing the sites for inclusion on the ultimate map. Although the city held dozens of public meetings, the ultimate selection of sites was done by professional staff and not by elected leaders. At the last hearing in June 2016, before the November election, your elected leaders weren’t allowed to make even one change to the proposed map because we’d boxed ourselves into a too-tight timeline. We’ve conducted all of our meetings in public. We interviewed and chose the consultant in public; we traveled to Sacramento as a group to hear directly from state housing regulators; we’ve asked our statewide housing expert attorney every possible question in public; and we’re actively debating the merits of various sites in public. While every leader endorsed the last plan, it lost at the ballot. I believe it’s possible that this time around we might not be able to reach unanimity – yet based on an improved process, it will be a better plan and will hopefully succeed at the ballot box. I’m proud of the fact that we’ve taken the time required to build confidence in the process. I always remain hopeful that we’ll see our way to compromise and unanimous agreement. But I recognize that might not be possible. For my part, I was strongly in favor of diving deeply into this and handling it for at least the next two housing cycles, which would mean choosing enough sites to avoid having to turn around and upzone again in three years (2021). But others in the group feel strongly that we should do the minimum upzoning required to get ourselves out of the penalty box with the lawsuits and housing regulators, even though we’ll be right back at this same table in a little more than a year. I’ve been willing to compromise on this aspect, but it feels like a big concession. When it comes to choosing the sites, I think we need projects that we’ll be proud of and that will accomplish our goals. At least one should be innovative and exciting, and an agri-hood that likely includes a “tiny home” component, is tremendously appealing. Together with some others on the Council I’m also interested in providing the largest amount of affordable housing possible, and that means that there is really no excuse for excluding the only undeveloped site owned by the city, which is on Quail Gardens Drive. Deed-restricted affordable housing is possible when a city can provide the land. The 7.6-acre site we own there makes this possible. Sites we did NOT send forward for further evaluation at this time include the county-owned 12-acre site off El Camino Real where trash used to be burned – there wasn’t enough time to negotiate with the county and gather the required information regarding expensive environmental cleanup. We also excluded the privately owned Sprouts site on Encinitas Blvd. and the L.A. Fitness site on El Camino Real, both of which have existing long-term leases and no demonstrated interest in developing housing. Whatever sites we ultimately choose will generate opposition. But this is a good-faith effort on our part to evaluate the whole city, work within the existing housing laws and get us the best possible housing plan. This week I spoke at the Sierra Club and then at a forum entitled Beach Cities Politics. 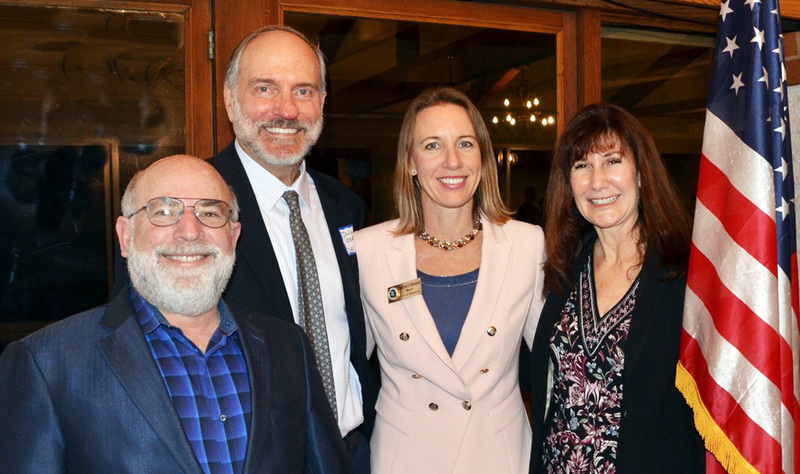 In the top Beach Cities Politics photo are (l. to r.) Michael Gelfand, Del Mar Mayor Dwight Worden; me; and Solana Beach City Councilmember Jewel Edson. 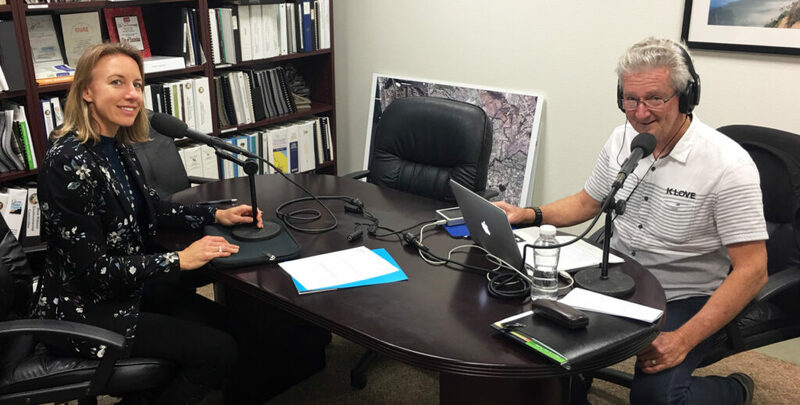 I also enjoyed an interview with radio station K-Love (102.1 FM) in which we talked all about Encinitas and the projects we have going on. Want to sit on a city commission? The annual recruitment for city commissions is now open! Being a city commissioner is a great way to be officially involved in a role that requires a relatively small time commitment and allows you to see the city operations from an insider’s perspective. For more information and to apply, click here. The deadline for new applicants is Thursday, January 25, at 6 p.m. Terms begin March 1, 2018. Not every community has vacancies every year. No matter how you choose to participate in helping create the future of Encinitas, I sincerely want to thank you for continued interest and engagement! What would a letter from me be without another Hamilton update? 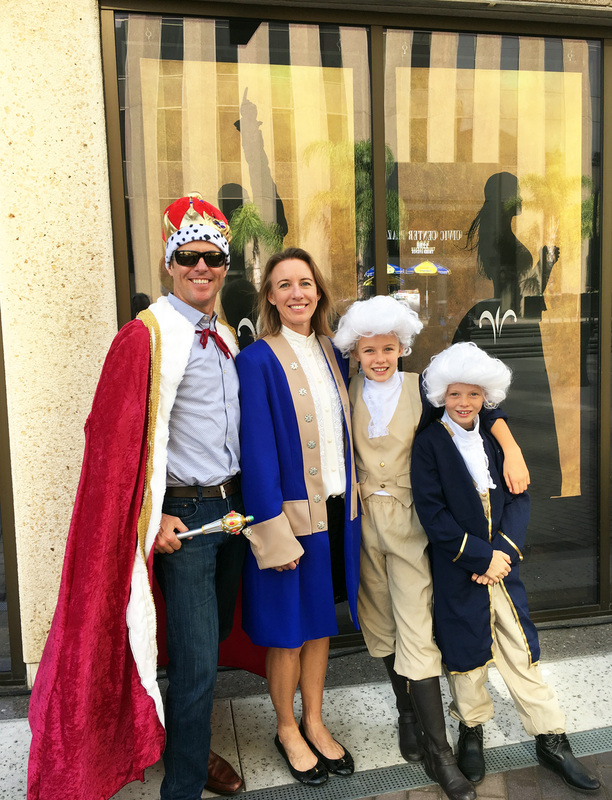 The Blakespear family thoroughly enjoyed seeing Hamilton in San Diego last week, fully dressed in costume! We are three Hamiltons and one King George III (one of our favorite characters in the show).